It is no secret that Microsoft is porting traditional native desktop programs of Windows to the company's new Universal Windows Platform (UWP). Rumors were floating around on the Internet for some time now that Microsoft was working on a Windows Explorer / File Explorer UWP version. Windows 10, just like Windows 8, ships with File Explorer, a rebranded version of Windows Explorer that is a traditional desktop program. If you have worked with Windows Explorer before, you will feel right at home when you start using File Explorer. 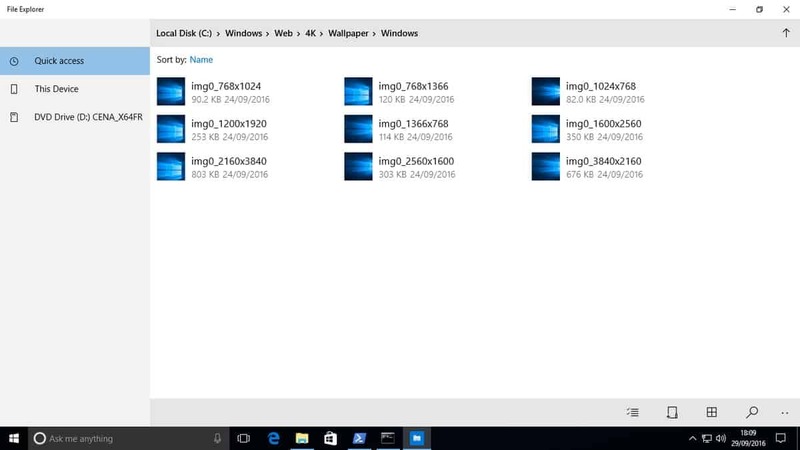 While there are some changes, most features remained part of File Explorer. Creating an Explorer UWP application on the other hand does not guarantee that. Eagle-eyed users of Windows 10 may have noticed that Microsoft pushed a new system application in the latest Insider build. The app is named Explorer, and does not start when you try to launch it. Tom Hounsell however managed to launch the application on Windows 10, and posted a screenshot of it on Twitter. File Explorer, that is the working title of the app, is a rather bare bones looking affair currently. One explanation for this is that it is not a finished product yet. The availability in Insider builds, and the fact that you cannot just start it at this point without tricks, suggests as much. However, since we don't have confirmation, it can very well be that this is more or less what you get when the app is released. The app displays quick access, the device's file structure, and optical drives connected to the system in a sidebar. It seems likely that this is also the place for network drives. The main area lists the path at the top in a breadcrumb structure, and below that the files. The bottom bar finally lists options to change display options, run searches and probably more when you click on the menu icon on the far right. This could lead to the file menu, as there is neither a toolbar nor a menu bar at the top of the window currently. If you compare the functionality to File Explorer, you will notice that other elements appear to be missing. There is no back and forward button for instance, and also no history option visible. It is also unclear if there is a right-click context menu, and if there is, how it looks like and if it will replicate the functionality of File Explorer, or if it will be limited. Now You: What's your take on Microsoft's plan? The post First Screenshot of the new Windows Explorer app appeared first on gHacks Technology News.